It’s a Friday night and Eric and I are hanging out and decide to give our nieces and nephews a call to catch up. One thing that can be so hard about living far away from family is how much you miss them! 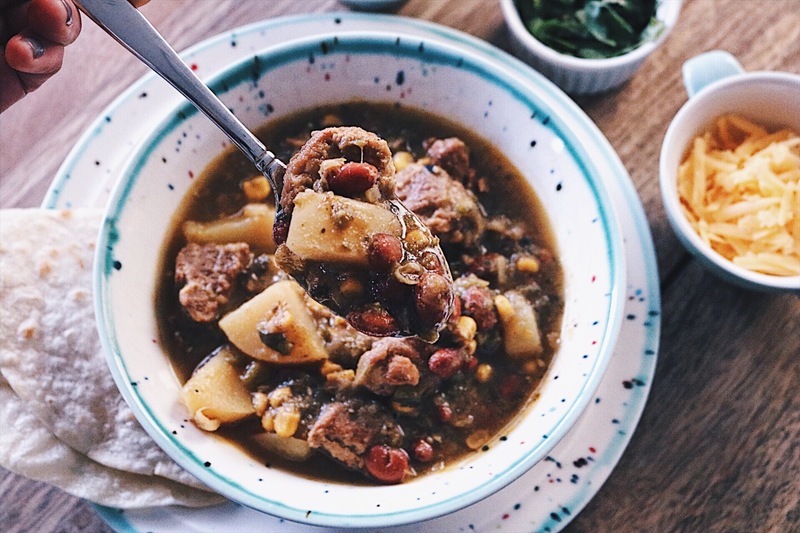 Eric’s sister tells us they’re hanging at home and she’s got a pot of green chili going for dinner with pinto beans and roasted corn – this sounds SO good to both of us and we give each other the look – a look that says we’re eating that ASAP! We get to facetime with our lively nieces and hear all about what they’re up to that night and when we hang up we miss them all so much. But…on the other hand we’ve got a great meal idea inspired by Eric’s sister and the next morning I do some research for the recipe and I’m off to the store with my list for this Green Chili Stew with fresh roasted green chilis, hand cut chunks of browned pork snuggled in with hearty pinto beans and corn inspired by Eric’s sister, all submerged in a stew broth thickened with potatoes and topped with freshly grated cheese. It’s so comforting and makes us feel like we didn’t miss out as much as we had felt the night before. 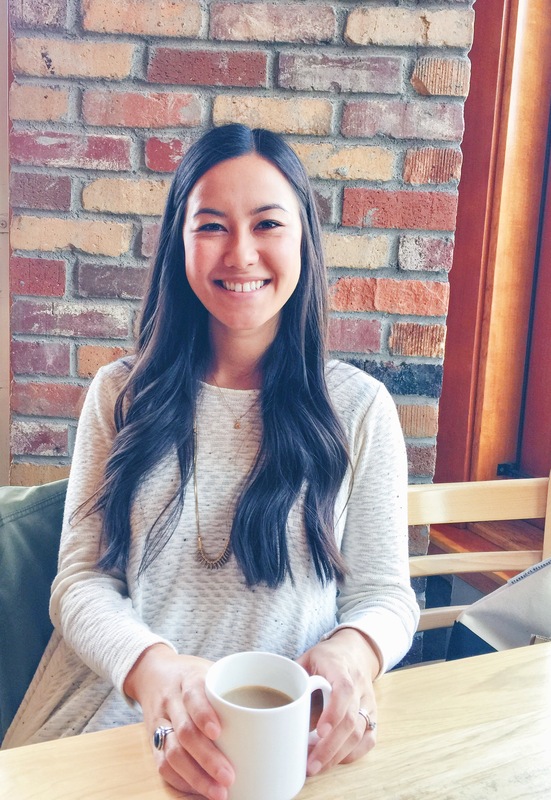 I love how food can comfort you in moments when you need it most – these are always my favorite meals! This was the first time I had roasted my own green chili’s and this was the perfect recipe to start with since they’re the star of this show. They get placed on a sheet pan and broiled on the top rack of the oven – while being carefully watched and turned – until they’re blackened on all sides and soft on the inside. Once they’re done in the oven they get removed and wrapped tight in foil so they can steam from their own heat. Once their steam is complete the skin and seeds get removed, the flesh is chopped up and added to the chili. 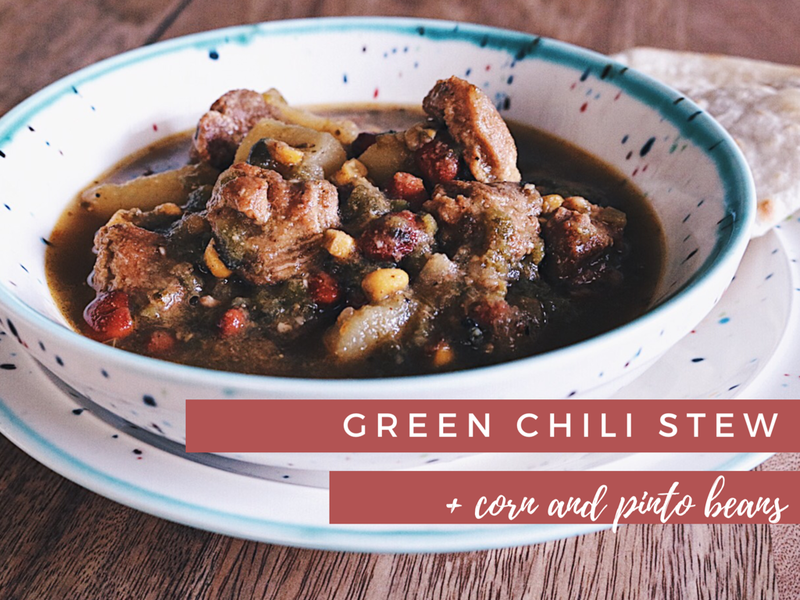 Giving it the unmistakable green chili color with the flavor of poblano peppers – slightly spicy and aromatic. 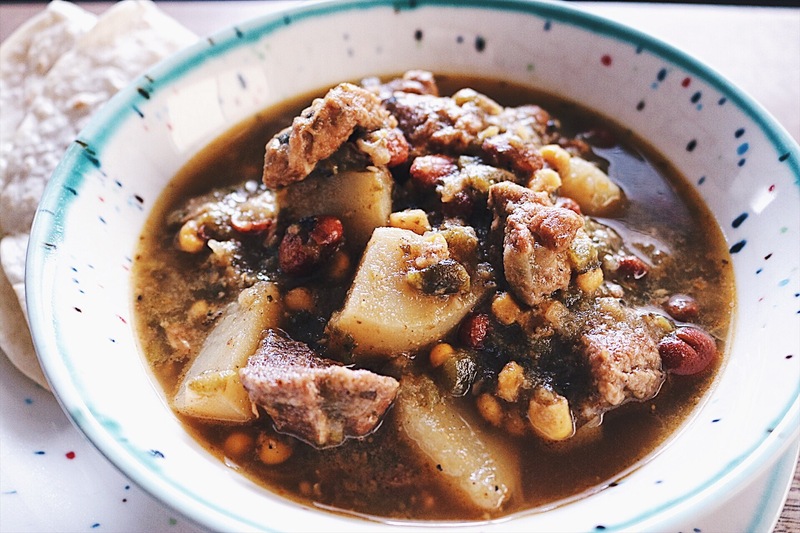 A hearty Green Chili Stew recipe with fresh roasted Poblano peppers, corn and pinto beans. For the pork – Heat the vegetable oil in a large dutch oven or heavy-bottom soup pot over medium heat. Toss the cut up pieces of pork in the flour, and a sprinkling of salt for seasoning. When the pot is hot add the pork in batches, don’t overcrowd the pan, and allow it to brown on all sides – about 5 minutes total – remove from the pot and set aside. For the stew – In the same pot that you browned the meat, over medium heat, add the diced onion and let cook for about 3 minutes, stirring frequently. Add in the beer to deglaze the pot, minced garlic, spices and 1 teaspoon salt. Use a wooden spoon to scrape up the browned bits from the pork and onions for a few minutes until the alcohol has cooked out of the beer. Add in the chicken broth, bay leaves, corn, beans, chopped Poblano peppers, and browned pork – bring to a boil over high heat. Cover and reduce heat to simmer for about 2 hours or until the pork is fork tender. Once the pork is tender, add in the cut up potatoes and continue simmering covered for 1 hour. Once the potatoes are tender and cooked through you can remove the bay leaves and add additional salt to taste if needed. Serve up a hearty bowl topped with shredded Cheddar or Monterey Jack cheese and a side of warm tortillas. Don’t want to miss a recipe or post?– subscribe to email updates or follow along on Instagram or Pinterest. < Previous Happy 4 year wedding anniversary!